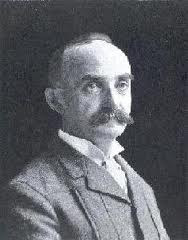 Professor Heilprin was born on this day, March 31, 1853 in Hungary. He was a naturalist, geologist and author. His book “Alaska and the Klondike: a journey to the New Eldorado, with hints to the traveller” and his book “The Dial” were both written in 1899 and are found online. 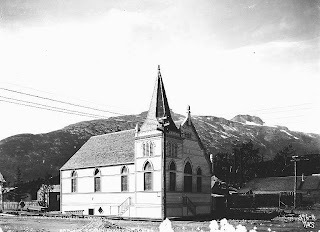 The first book (online) has some nice photos of Skagway in 1898 that I have not seen before. Seen above is the professor. He died in 1907 in New York City. Herman was born in 1865 in Denmark. He ran the Seattle Saloon on the northwest corner of 6th and State Street known as “the Gentleman’s Saloon”. Grimm stood for no nonsense. “No women, no gambling, no trouble,” was his motto. On January 22, 1904, when Army deserter Jeff Halloway, “a drunken roysterer (sic)” and “flourishing a revolver,” caused some trouble at the Seattle, Herman personally ushered him out the back door. He also owned the Pack Train Bar. Grimm built a house in 1898 at the northwest corner of 6th Avenue and Alaska (or Holly and Ivy on original street maps). The present owner has been remodeling and meticulously restoring it over the past 9 years. It features a “widow’s walk,” hipped roof, bay windows, gable roof dormers, and barge boards over the porch. Past additions to the rear and a rock fireplace have been removed, and the house was raised. Property records show that the property sold for $150 in 1898. 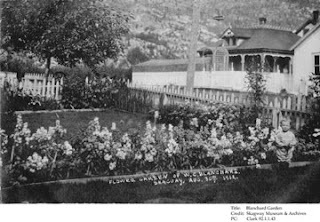 In 1902 he had a garden, 50 feet by 100 feet where he raised strawberries, cabbage, cauliflower, kale, carrots, celery, parsley, peas, beans, lettuce, spinach, rhubarb and potatoes. He also had cherry and apple trees. The garden was one of the federal government’s experimental stations. Seen above is his neighbor’s garden with the Grimm house in the back. Herman Grimm died on this day, March 30, 1928 and is buried in the Pioneer Cemetery. 1900 census;1902 directory;1905 directory; 1915 directory;1910 census; Skagway death record. U.S. Congressional report of the Office of Experiment Stations, issue 4425, 1902. Francis M. Rattenbury was born in 1867 in Leeds, England. Rattenbury emigrated to Canada in 1892, first working as agent for Bradford investors in Vancouver. His experience in commercial and civic design, structural systems, architectural historical vocabulary and office practice furthered his career quickly. Aided by his prize-winning ability as draftsman, Rattenbury quickly supplanted the earlier generation of immigrant architects in the province. He won the 1893 competition for the new Provincial Legislature in Victoria a building which is beautiful and which is open for tours today. Despite cost overruns, the building opened in 1898 to considerable praise. He also designed the famous Empress Hotel in Victoria which overlooks the bay. Rattenbury’s demonstrated competence at architectural display won him patronage from the leading institutions as well as government. I read once that he designed the White Pass administration building in Skagway that today houses the National Park’s administration. 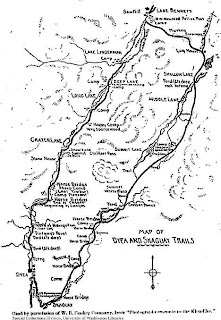 Rattenbury also was a promoter of the Bennett Lake & Klondyke Navigation Company. Unfortunately for one so talented in architecture and business, he failed miserably in his personal life. Rattenbury married Florence Eleanor Nunn on June 18, 1898 and had a son Francis Burgoyne Rattenbury that same year. 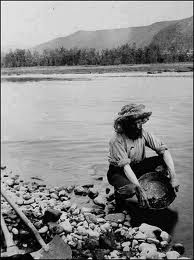 Rattenbury and Florence did not get along and fought often when he was at home, but he stayed away on projects in the Yukon during the gold rush. Eventually he divorced in 1925 and married Alma, who at the time of their marriage was 26 to his 56 years of age. Stoner was found guilty of murder and sentenced to hang. Mrs. Alma Rattenbury, although chastised for being an adultress, was found not guilty of any crime and released. Despite her freedom, Alma was distraught. Four days later she waded into the Avon River and resolutely stabbed herself six times before delivering a fatal wound. Ouch, how Shakesperian! Stoner’s death sentence, because of public pressure, was commuted to life imprisonment. After serving seven years he was released in 1942 to join the army. He took part in the Normandy Invasion on June 6, 1944. Canvass was the U.S. Commissioner and White Pass clerk in the Gold Rush in Skagway. He was born in 1863 in Mauch Chunk, Pennsylvania. 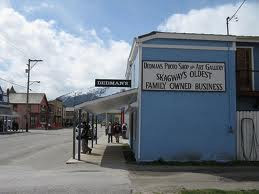 His daughter Bessie married Henry Dedman and their store is still in business in Skagway run by their great great granddaughter Avril. He died on this day, March 25, 1943 in Skagway and is buried in the Pioneer Cemetery here. Another of the lost records from the Gold Rush Cemetery. 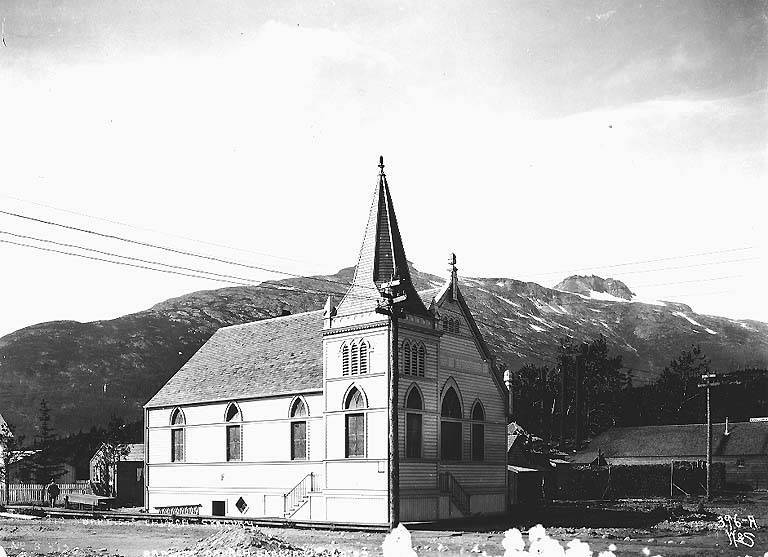 There were actually two Isaac Mallette’s – ours died on this day, March 24, 1899 in Skagway and is buried here. His nephew, I believe, also from Iowa stayed in the Yukon, mining gold and then staked a land claim in Mayo, Yukon in 1912. So after Wood left the mayorship of Seattle, Thomas J. Humes was appointed mayor on November 19, 1897. He must have left in 1900 for Nome because I read today that he left Nome with $20,000 in gold. Then in 1904 he left the new Fairbanks camp as a frozen corpse, lashed to a dog sled and was mushed to Valdez over the Valdez Trail. William R. Hunt in “North of 53 – The Wild Days of the Alaska-Yukon Mining Frontier 1870-1914, 1974 MacMillan, page 101. William Wood was born in 1858 in Marin, California to Canadian parents from Ontario. William became an attorney, land speculator, electric trolley line president, and Seattle mayor. He was a conspicuous figure in the business and political life of Seattle for more than a quarter century and was the key original developer of the Green Lake neighborhood. He served as mayor of Seattle from April 1896 to July 1897 when the Klondike Gold Rush supplied him with an opportunity more golden: providing steam passage from San Francisco and Seattle to Alaska. I have often heard people cite him as one of the many people who dropped everything and headed for the Klondike to seek their fortunes, but actually he was a savvy businessman who capitalized on the transportation needs of the gold rush. William Wood died on this day, March 23, 1917 in Seattle of an intestinal ailment. History of Seattle online; nps.gov; University of Washington Libraries, Special Collections, Washington State Biography Pamphlet file; Men of the Pacific Coast (San Francisco: Pacific Art Co., 1903), 479; UW Libraries, Special Collections, Struve Scrapbook, Vol. 1, p. 24; 1880 census in California. 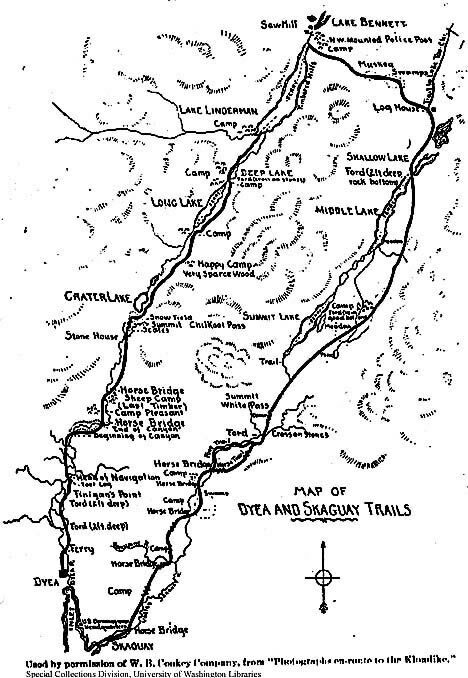 A very cool map showing both trails. 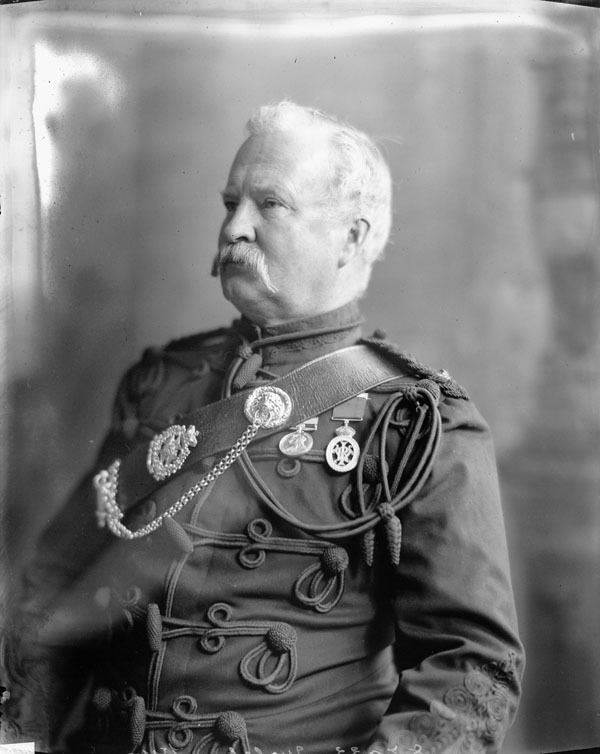 James Morrow Walsh was born in Prescott, Ontario in 1840 to a Welsh-Irish immigrant family. Walsh joined the NWMP in 1873 when it was formed. He was known for his association with Sitting Bull in the 1880’s, and was appointed the first Commissioner of the Yukon Territory and also the Canadian Gold Commissioner of the Yukon in August 1897. He arrived on the S.S. Quadra to Skagway in 1897. His fame during the Gold Rush was that he was the one who proclaimed that people needed to have 2000 pounds of goods to cross into Canada. Whether he did that for humanitarian reasons to prevent starvation of goldrushers, or whether it was a political decision to make it more difficult for the thousands of stampeders to overwhelm Canada, we do not know. We do know that Mounties were then equipped with gatling guns at the pass to enforce the law. After his decision, he did not serve very long and resigned soon after in 1898. He died on July 25, 1905 at his elaborate home called “Indian Cliff” in Brockville Ontario at the age of 62. According to his obituary he was sick for 10 days, from an “affection of the heart”. Mount Walsh in Kluane National Park is named after him.